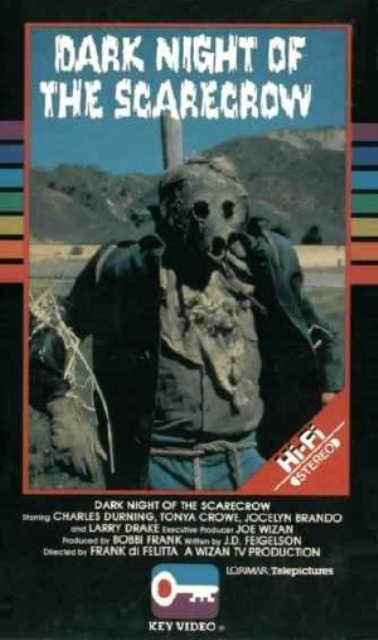 DARK NIGHT OF THE SCARECROW on DVD…Finally! There are many films which I would deem long overdue in terms of getting an official DVD release. 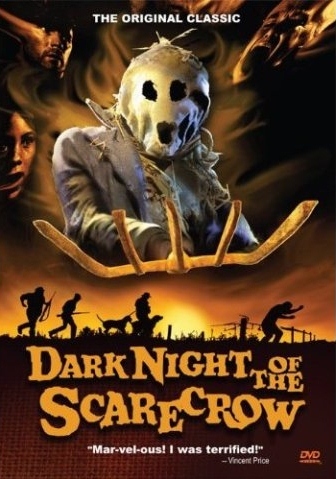 Of that list of rare gems, DARK NIGHT OF THE SCARECROW was always listed near the top. This made-for-TV thriller premiered in October of 1981. I was eleven years old at the time, and an avid fan of horror. Unfortunately in that pre-VCR/cable and “too young to see R Rated films” world, there was little to satisfy my appetite. I remember seeing the television previews and being determined not to miss it. A full hour before the movie started (courtesy of CBS) I had carefully laid blankets on the floor of my bedroom while positioning my 13 inch Black & White television for optimum viewing. My efforts were not in vain as I was totally blown away by this film! The film stars Larry Drake as the developmentally disabled “Bubba” – not to be confused with “Benny,” his other mentally challenged character on “L.A. Law.” As his character’s name would imply, this film does indeed take place in a Southern, rural town. Bubba spends his days in farm country making flower necklaces and singing songs with a young, local girl named Marylee (Tonya Crowe). This camaraderie doesn’t sit well with some of the townsmen, particularly their diabolical mailman – Mr. Otis Hazelrigg (played by Charles Durning at his most despicable). Mr. Hazelrigg, aside from peeking at his neighbor’s mail, enjoys nothing more than tormenting poor Bubba while riling up his less intelligent cohorts. He is convinced that the relationship between the thirty-something year old man-child and grade school girl is perverse. 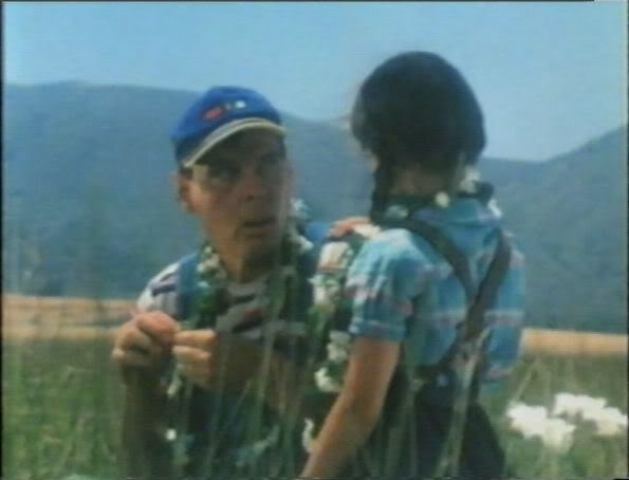 It is implied during the course of the film that it is, in fact, Mr Hazelrigg’s interest in the girl that is far more unsavory than Bubbas. While trespassing in a neighbor’s yard, Marylee is viciously attacked by the family’s canine. Bubba saves the girl and carries her unconscious body back home to her parents who, quite understandably, flip out. Rumors quickly spread that Bubba killed her (think “Of Mice and Men”) prompting Mr. Hazelrigg to summon his redneck troops. Before the truth is revealed, they shoot Bubba to death as he unsuccessfully tries to conceal himself via the body of a hanging scarecrow. The men are tried in their local country-fried judicial system that is so skewed you’ll find yourself humming the classic hit, “The Night the Lights went out in Georgia.” As the guilty-as-hell men are all set free, Bubba’s irate mother screams that there are other kinds of justice in the world. It is with this line that the stage is set for each of the perpetrators to meet their untimely demise. Until the dramatic last moments of the film, you are never sure if they are being killed off by the pissed off District Attorney or perhaps by something far more supernatural. I didn’t know it at the time but this “revenge from the grave” tale was a throwback to those fabulous EC Comics that prospered in the 1950’s. 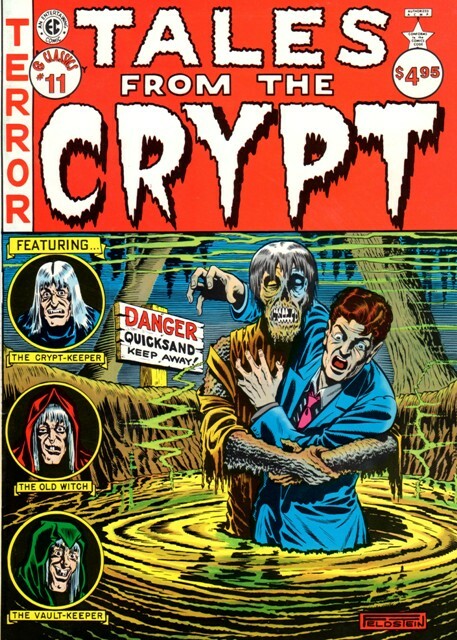 “Tales from the Crypt,” “The Vault of Horror,” and “Haunt of Fear” were titles that routinely dealt with poetic justice doled out by the hereafter. Before their eventual demise at the hands of the Comics Code Authority (CCA) they provided some of the most amazing and graphic stories that still gain my appreciation today. Fortunately, by my teenage years I was able to buy their reprints at the local comic book shop. Until that time, however, DARK NIGHT OF THE SCARECROW and John Carpenter’s THE FOG were the only taste I had of this truly entertaining sub genre. I was able to view the film again (this time with that amazing feature known as “color”) on cable channel TBS and, later, after it received a limited VHS release. Although I later had a digitized copy, the picture was less than stellar and not much better than the first time I had watched this movie. A couple years ago I picked up my first copy of Horrorhound magazine and learned that the film was not only going to finally be released on DVD but also receive a digital upgrade. The article contained photos showing the film’s dramatic new face-lift along with a retrospective story. 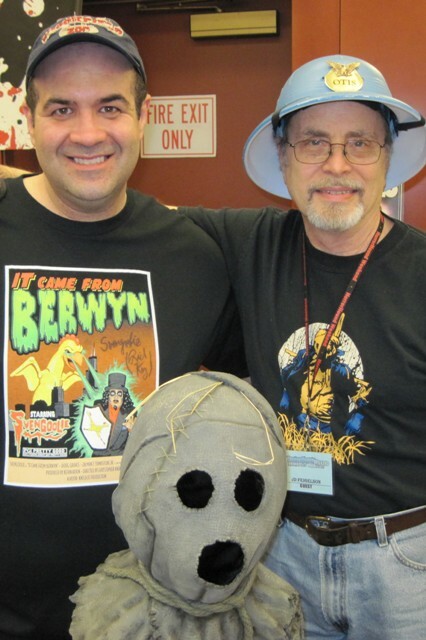 The film’s writer, J. D. Feigelson, had been tirelessly working on giving DARK NIGHT OF THE SCARECROW the send off it so richly deserved and it’s release was all but guaranteed. Unfortunately, a year passed and nothing happened. 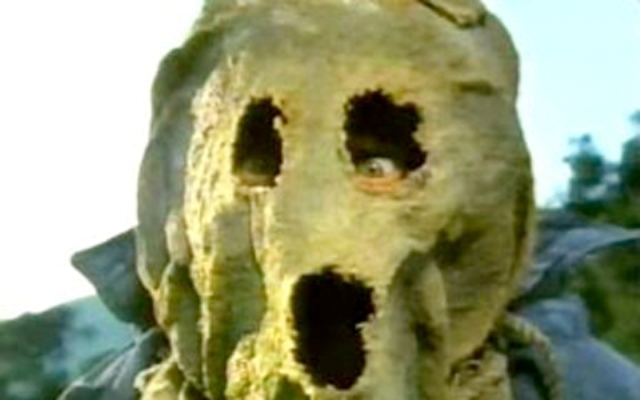 DARK NIGHT OF THE SCARECROW, now boggled down with release issues, seemed destined to fall back into the abyss. Before leaving him I mentioned how much I wished the film would finally get its DVD release. “Your wish is about to come true,” he beamed. “It’s being released this Fall!” I am happy to say that the day after my fortieth birthday, the event did come to pass. I look forward to taking some time out of the upcoming weekend to watch it. This time, however, while sitting in a comfortable sofa and on a digital, wide-screen set. Growing older, it seems, does have its perks. This entry was posted in Big 80's Horror!, DVD/Blu-Ray Review, Supernatural and tagged CHARLES DURNING, DARK NIGHT OF THE SCARECROW, HORRORHOUND WEEKEND, J.D. FEIGELSON, LARRY DRAKE. Bookmark the permalink. ← Horror Host Spotlight on Count Gore de Vol! Hey, Dave, thank you so very much for this wonderful article. Not only is it interesting it is quite well written. 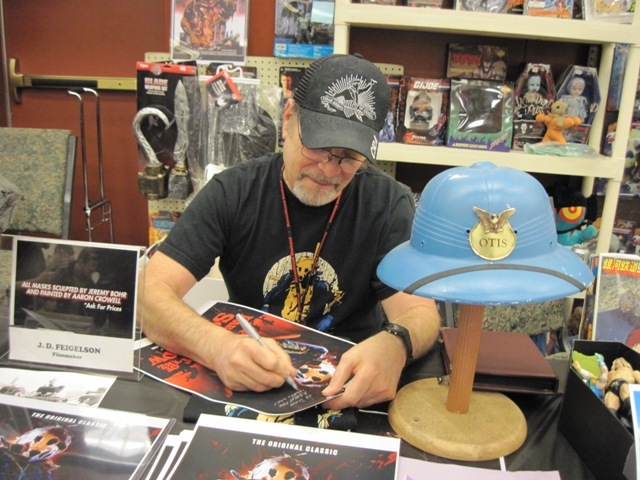 Hope to see you at HorrorHound in Cincie. My very best…J.D.